I'm not a colorer, so when there are large images I want to color, I paper piece instead! I stamped the umbrella image on three different patterned papers from the Lily Bee Design Head Over Heels 6x6 paper pad and cut them out. 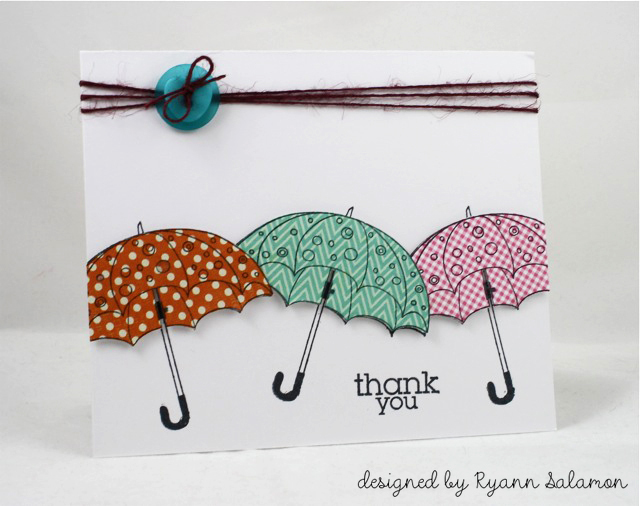 After stamping three umbrellas on my card base, I adhered down the patterned umbrella tops and finish out the rest of the card. Easy peasy! I hope you've had a relaxing weekend and have a wonderful week ahead!! These umbrellas are paper-pieced to perfection! Really cute, Ryann! I love how fresh this feels! You're A-mazing at CAS!